Here you’ll find important publications of Umbrella Inc, including our regular news bulletin, our annual report, the company constitution that governs us, and the current strategic plan. Transparency and accountability are important to the Umbrella Inc. Each year we prepare an annual report which contains a comprehensive summary of our activities throughout the previous year. The report is intended to provide our members and other interested parties with clear and accurate information relating to our activities and financial performance. You are welcome to download a copy of the current and previous annual report here. The current strategic plan – prepared by the Umbrella Inc management and Board and reviewed every 3 years – details strategies to achieve Umbrella Inc.’s mission. The plan includes Key Performance Indicators (KPI’s) as a means of measuring success and providing accountability in reporting. All incorporated not-for-profit organisations must by law have a constitution which set the governing rules for the organisation. You are welcome to download a copy of our constitution here. Download our Flyer. It provides general information about Umbrella Inc. 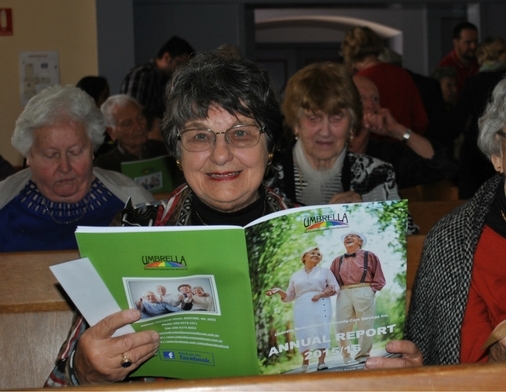 This is a detailed booklet about the multi-award-winning services and programs at Umbrella Inc. Umbrella is a not for profit organisation and there is a minimal fee that clients have to pay for our services. We believe that transparency reflects on credibility and creates confidence in our organisation, and we are committed to disclose and negotiate all fees with every CHSP & HCP client up front. We also created the first Home Care Package Budget Calculator to assist seniors with their decision. Visit the Home Care Package Budget Calculator page for more information.